I have been away from blog land and my craft stash for 4 whole weeks - boy did I miss it. Anyway, I'm back and its time for a CPS challenge. 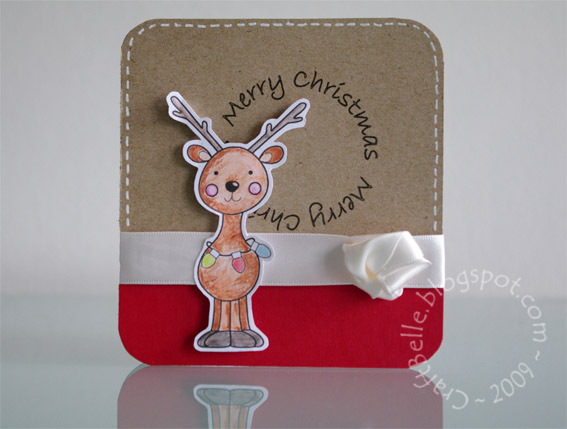 I'm using the super cute "Reindeer" by the wonderful Brooke over at Magnolia Grace. What a fantastic surprise it was to find a whole bunch of digital stamps in my inbox just waiting to be printed out. Thanks Brooke. So, here goes. I've added faux 'Kwerner' stitching; ribbon with a fancy knot; and a sentiment for the circle element. Edit: I just had look over at 365 cards and the new challenge 'knots' fits my card perfectly. I must have been picking up Pam's subliminal thoughts when she made her card. Check out the blog here. Also, Pam is looking for a new DT team. Good Luck everyone! Super cute--love that reindeer!! Fab job with colouring it in! This is so cute, that little fellow is totally adorable and I love how you incorporated the sentiment! well this is just tooooo cute! This is darling! I love the little ribbon rosette! Thanks for playing at CPS this week! So adorable, and glad that it worked with my challenge over at 365 Cards!